A couple of months ago I reviewed the hybrid amplifier Maverick TubeMagic A1, distributed in Italy by Troniteck, a young and dynamic Company which specializes in budget-oriented HiFi products. Together with that amp they also sent me a pair of loudspeakers, namely these Dynavoice DM-5 I'm going to evaluate right now. These are quite unusual speakers, considering they are claimed to be two-ways (actually they are mostly three-ways, see below for technical details) and use a strange dome mid-tweeter paired with a isodynamic tweeter. 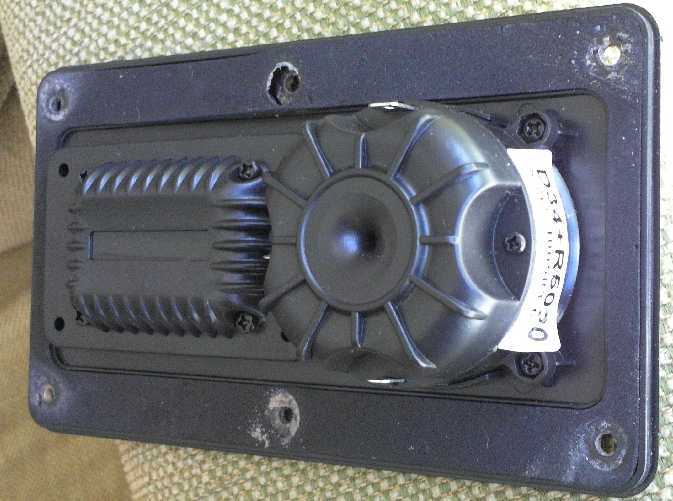 Dynavoice is a Sweden-based Company but the speakers are manufactured in China, and this explains why the price is so low, considering how these speakers are made. For just 280 € you get a rather complex design with three drivers, a fully adjustable mid-high range, plus a very high quality finish: a classy black piano lacquer matched to black oak or natural oak side panels. Impressive, to say the least. The Dynavoice catalogue is plenty of different speakers lines and models. 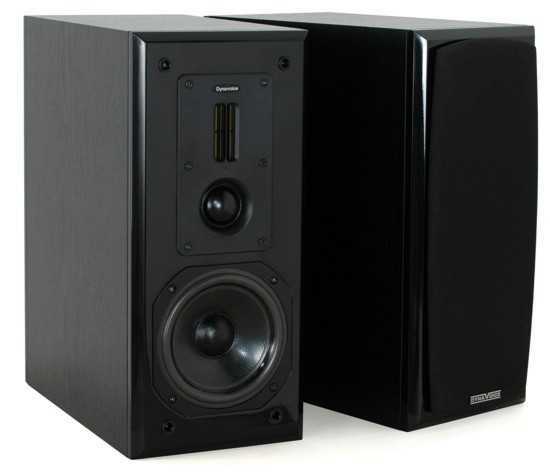 Included into the ambitious Definition series, to which these DM-5 belong, there are several floorstanding designs and a bigger bookshelf labelled DM-6, sporting a larger (17 cm) woofer. These DM-5's are rather large bookshelf loudspeakers (390 x 175 x 350 mm) which try to belong to a league of their own. 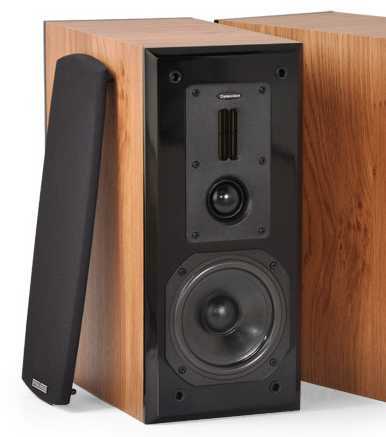 Indeed, while the 99% of bookshelf loudspeakers in this price range are standard, boring two-way designs, these DM-5's use three drivers, but are claimed to be a two-way design. Weird? Read on. The 2" (yes) dome mid-tweeter and the isodynamic tweeter work in parallel configuration and the latter should help the former in terms of extension to the highest frequencies. A kind of supertweeter, if you wish, but not exactly so. Actually, looking carefully at the technical papers, it turns out the second tweeter has been cut at 9000 Hz (yes, 9 kHz) with a 12 dB/oct slope. The dome unit crosses the midwoofer at 1800 Hz (12 dB/oct), instead. In other words, it seems the two high range units work together above 9 kHz. This might sound strange but perhaps the larger dome needs some aid at the extreme portion of the high range. The cabinet appears to be extremely well made and uses thick MDF panels. The front and the back of the cabinet are black piano lacquered. A cool touch. The inside is stuffed with a lot of acoustic foam while internal wiring uses cables of decent thickness. The cabinet is sturdy and not prone to resonate. Only the side panels resonate a little bit after a strong knock test. For just 280 € (street price might be lower) you get lots of substance. Claimed tech specs are a bit optimistic, in my opinion, especially the sensitivity datum (91 dB) and the bass range extension (40 Hz at -3 dB). Available finishes: black oak or natural oak, black piano lacquer (front and rear panel). It is not difficult to find a pair of these speakers worldwide, just visit the official website for a list of dealers. At this moment (Jan, 2012), Dynavoice speakers appear to be distributed over 15 different Countries. It is possible to purchase these even at several Ebay stores. I've listened to these speakers in direct comparison with another pair of budget bookshelves (review soon to appear on TNT-Audio) and, of course, with my reference speakers within this price range, namely the Norh 4.0. I've used different amplifiers, ranging from budget gear (Class D amps like the Dayton DTA-100a, Trends Audio TA 10 etc.) to very expensive stuff (NuForce REF9 etc.) in order to evaluate the real limits of the speakers and their real world quality, when installed into a budget-oriented chain. First of all, in each and any position of the X-Change level control, I've never felt this speaker to be particularly lively or transparent. Increasing the level of the mid-high range doesn't help much, as it seems there's a veil, especially in the mid range, that makes you wonder why isn't there a presence control as well! Hence, there should be a reason for this kind of feeling. In my opinion all is due to the quality of the dome mid/tweeter driver. Its job is to reproduce a quite difficult portion of the audio range (1800 Hz-9000 Hz) and, somehow, it fails to do everything correctly. Perhaps its membrane is too heavy and large for being a real tweeter but still too weak to act as a real midrange. The presence effect is missing, especially on strings, which don't sound metallic as they should. More or less the same applies to horns, saxophones, trombones...always too shy and lacking aggressiveness. Voices are generally good though they can sound a bit confuse especially at high listening levels. Generally, I'd say there are traces of a rather artificial sound, and this becomes particularly evident comparing the DM-5's to the Norh 4.0's, for example. These are radically different speakers, indeed: just two ways with a very simple, super high-quality crossover between two excellent quality drivers: the Music just flows freely, giving the listener the illusion of being listening to a single, full-range driver. With the DM-5'5 I was concentrating myself of the sound coming from the three different drivers, hence losing the big picture. The bass range, with a small midwoofer which reproduces even part of the mid-range (up to 1800 Hz), can't be extremely deep nor powerful. The -3dB point at 40 Hz, as claimed by the tech specs, is rather optimistic, in my opinion. Cranking the volume up you can even get some impressive (considering the size of the unit) impact so I'd generally judge the bass performance as adequate, within the given contraints in size and load volume (size of the cabinet, that is). 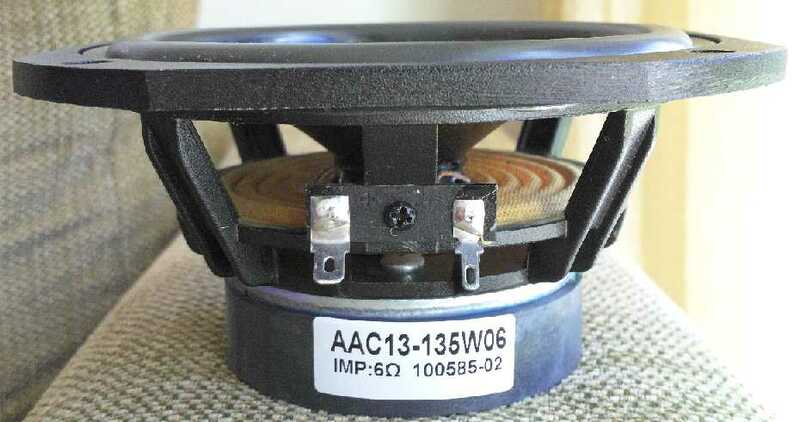 After all, one shouldn't forget this is a 13 cm woofer, more or less like the one of the Norh 4.0's which have a lighter and weaker bass range (load volume being smaller). On the oher hand, the comparison with the other pair of bookshelves (review to appear), which make use of a 21 cm woofer (!!! ), is quite embarassing, to say the least. Depth, impact, weight, articulation....everything is better. This proves that the laws of physics can't be neglected. This loudspeaker can handle wide dynamic range musical programs adequately though some energy is missing in the mid range. Again, one can't help but notice there's a lack of liveliness in the mids and this makes the overall dynamic performance barely sufficient. From a strictly quantitative point of view, these speakers can reproduce high sound pressure levels, provided the amplifier delivers an adequate amount of clean power. In any case, I'd avoid pushing the envelope too hard: especially in the bass you can't expect an explosive performance! In the mid range, the lack of presence teams up with a certain tendency to dynamic compression. This is something that can't be improved using the built-on tone controls. I haven't been able to detect the reasons for such a strange behaviour: perhaps the dome mid driver is too heavy, perhaps the midwoofer frequency cut is too high (1800 Hz) or perhaps the crossover network is too complex. Certainly something is wrong, because the snare drum, just to name an obvious example, isn't quick, precise and explosive as it should be. Moreover, especially with pop and rock tracks, PRaT and punch could have been better. In the high range, where the isodynamic tweeter comes into play, things go a little bit better and in this area micro and macrodynamics performance is good. Summarizing, this isn't a speaker made to impress. With certain musical genres it might sound boring but don't forget this can be a plus in the long run, because of the low perceived listening fatigue. The 3D image, especially when compared to the stunning Norh 4.0 virtual scene, doesn't impress, to say the least. The width of the soundstage is good but height and depth are barely sufficient. Even image focus, for example that related to single voices of a choir, could have been better. It is rather difficult to pick up a single voice and find its right place in the space. Sometimes, even large portions of a big choir are hard to detect with sufficient precision. Again, everything seems related to the mid range performance (driver, crossover network, whatever). When compared to the Norh 4.0 it seems these DM-5's lack ambience and air, too. Even the sound of the recording hall, when this has been picked up during the recording, is hard to detect, while this becomes easy to appreciate and reproduce when the Norh's are playing. Anyway, one shouldn't forget these speakers are quite inexpensive and probably aimed to a kind of customer who doesn't care much about imaging, soundstage, focus etc. Audiophiles who devoted their whole life to these parameters probably won't put these speakers on their wish list. These Dynavoice DM-5's seem to benefit from a long break-in workout. Moreover, it seems they suffer from inactivity: leave them off for a couple of weeks and they'll need some extra break-in time (not much, generally 10-15 minutes will be sufficient). The claimed sensitivity datum (91 dB), together with the low nominal impedance (6 Ohm) would suggest even low powered amplifiers can be successfully used. Don't let the specs fool you! In my opinion the real sensitivity is lower than claimed so if your listening room is large and you prefer high listening levels you should plan to use a quite powerful amplifier (40-50 watts). 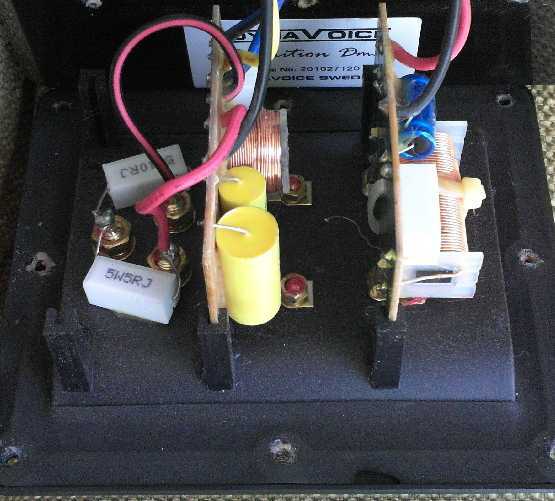 On the other hand, if your room is small and you don't like or need high SPLs you can even use a low powered ampifier, something around 10 watts per channel, like all those Class D inexpensive integrateds. In order to find the right tonal balance, plan to spend some time playing with the X-Change tone controls. Finding the right position isn't easy, and your preferences might vary from disc to disc. Generally, in my listening room and for my personal taste, I've found the +2dB setting to be the best compromise. When choosing the right stand height for these speakers consider it seems better to align your ears with the second (the isodynamic one) tweeter. Finally, feel free to substitute the X-Change jumper with a short run of good loudspeaker cable. The X-Change level adjusting system isn't easy to use: a pot or a lever would have been a far better choice. No other complaints...seriously! For the price the level of finish and craftsmanship is extraordinary, the DM-5 seems a loudspeaker belonging to another (way higher) price range. In use, I've noticed that the position of the X-Change jumper modifies the sound, not only in terms of level but even in terms of overall quality. For example, the 0 dB position sounds worse that the + 2dB setting. In the 0 dB position the sound was boxy and shut-in, something which can't be justified in terms of level of the mid/high range only. And every other position sounds slightly different, in terms of quality and not just in terms of quantity. Perhaps the quality of the resistors and their interaction with the crossover network play a role here. Of course, your mileage may vary. The tonal balance, as said, heavily depends on the position of the jumpers on the X-Change system. These speakers can sound bright or dark depending on this. As said, in my listening room the +2dB setting proved to be the best compromise, though from time to time it underlined the hiss of old master tapes. The bass range has physical limits that should be taken into account: the 40 Hz at -3dB claimed datum is certainly optimistic. The kick drum should be beefier and the snare drum punchier and faster. Horns, in general, lack some aggressiveness and liveliness. Overall, I don't feel these speakers are adequate for playing aggressive musical genres. If punch, rhythm and impact score high on your wish list, you should look elsewhere. Once upon a time this kind of speakers was not uncommon. I can still remember my old ESB 45LD three-way bookshelves also included a sophisticated midrange and tweeter adjustment (± 2 dB) system. They had a large dome midrange, as well. These Dynavoice DM-5's are quite versatile speakers, since they are easy to interface with the rest of the system and with the listening room. Certainly the X-Change adjustment system can solve more than a problem in the mid-high range. With a adjustment range of 6 dB I'm sure you'll find the setting that suits your needs! On the other hand, I can't approve (nor understand) the philosophy behind these loudspeakers: using two tweeters, one very different from the other, and a complex crossover network certainly increased costs and affected overall performance. A simpler approach, maybe? The bottom line is that if you're in the market for a mid-sized bookshelf which is nice to see and extremely well manufactured, which is versatile and inexpensive at the same time, you should include this DM-5 into your wish list. As far as I know there are not many (similarly built) competitors in this price range. There are certain grey areas in their performance (midrange in particular) but they do offer much at an unbelievably low price.